The ads are funded by MayDay PAC, an organization which backs campaign finance reform. Last month, MayDay PAC endorsed former New Hampshire state Sen. Jim Rubens over former Massachusetts Sen. Scott Brown in the state's upcoming GOP Senate primary. In the new ad, 'Honest Gil' claims to support Brown and sarcastically attacks Rubens for offenses such as wanting to "stop corruption in Washington" and "help the people of New Hampshire." 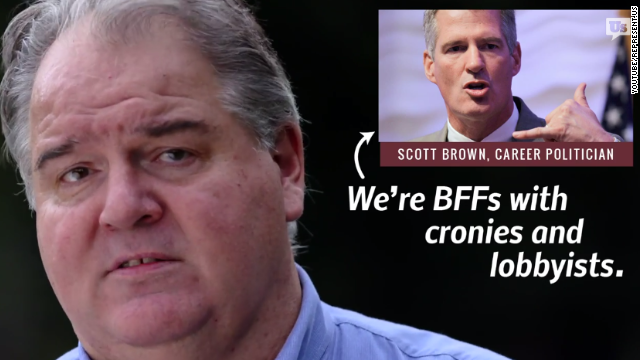 The ad portrays Brown as a defender of the current campaign finance system. The ad blitz is part of a larger $600,000 television and radio buy running up to the September 9 primary. While Rubens faces an uphill battle against Brown, MayDay PAC plans to spend as much as $2 million on his behalf, according to the Concord Monitor. More Democratic Party efforts to confuse the voters, and make them unable to pick the truth from the lies. Dems rely on their ability to lie and deceive, to get votes. Let's hear it rwnj, he's trying to buy the election, really? The Koch brothers made sure we all knew they gave 100 million to hospital, why aren't they as proud, or forthcoming with disclosure on their campaign contributions, the big democrat donors have, why so silent, not like a rich guy to hide giving money to help people. Hang on just one minute! I thought it was the moochers living off the government that the Dems relied on. Or was it illegal immigrants and dead people? Get your popcorn!!! The repblicon Klown car is coming to your town soon. Full of laughter lies and larceny, be sure and hide the children and of course your wallet. Democrats are a joke. Their PACs are a joke. And they turned our government into a joke with the incompetent Obama administration. Their jokes continue while the country suffers. And they want the American people to keep them in power? NO WAY!! No more Democrat Jokes on America. All of congress is the problem. "Democrats are a joke. Their PACs are a joke. And they turned our government into a joke with the incompetent Obama administration..."
Oh yeah, cause the Bush administration was totally competent... I have yet to find a republican that can wield logic past their first statement (which is always proven wrong immediately).